The BJP, in its manifesto released for Karnataka elections, made a plethora of promises to reach out to various sections - from farm loan waiver and other sops to farmers, freebies like laptops for students and smartphones for BPL women to a commission for cow protection. 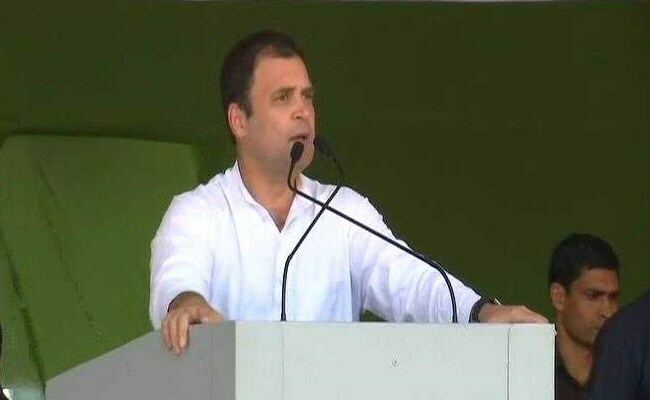 New Delhi: The BJP's Karnataka manifesto is a "poorly crafted fantasy built around a weak plot," Congress President Rahul Gandhi said on Friday, and asked voters to not waste their time on it. On Twitter, Mr Gandhi gave the BJP manifesto a "1/5 rating." "New Book Review! The BJP Karnataka Manifesto, inspired by Narendra Modi, is a poorly crafted fantasy built around a weak plot, that has nothing unique to offer voters. If you've read the Congress Manifesto, don't waste your time on this one. "Rating: 1/5 ? "Recommendation: Avoid," he tweeted. As it seeks to wrest the state from the Congress, the BJP said Rs 1.5 lakh crore will be spent on irrigation projects and farm loans of up to Rs 1 lakh borrowed from nationalised and cooperative banks will be waived if it is voted to power. The manifesto, unveiled by Karnataka BJP president and its chief ministerial candidate B S Yeddyurappa, said a 'white paper' will be brought out on the state's financial health under the Congress rule after the BJP forms a government. It said a Rs 5,000 crore 'Raitha Bandhu Market Intervention Fund' would be launched to cushion farmers against the effects of price fluctuations. The party said farmers would be sent to countries like Israel and China every year to study best practices in agriculture. The manifesto said Rs 25,000 and 3 gm of gold will be provided to brides of families living Below Poverty Line (BPL) at the time of marriage under its new scheme named the 'Vivaha Mangala'. The Congress manifesto for the Karnataka Assembly polls, released on April 27, promised to create one crore jobs and spend Rs 1.25 lakh crore on irrigation over the next five years if re-elected to power. Releasing the "People's Manifesto" at a function in Mangaluru, the Congress president had described it as the "voice of the people of Karnataka" and not a document prepared by "three or four people in a closed room". He had taken potshots at Prime Minister Narendra Modi, saying while the prime minister likes to tell people his "mann ki baat", this manifesto contained the "mann ki baat" of the people of Karnataka. The manifesto said the Congress, if voted to power, would create an "agricultural corridor" in the state with its 10 different agro-climatic zones and other natural advantages, offering immense opportunities for high growth in agriculture and allied sectors. It promised 50 per cent increase in"employability and creation of 15-20 lakh jobs per year and"reduction in professional tax. The Congress had also said it would endeavour to raise the employment level of women to 50 per cent in the government workforce and supply free sanitary napkins to girl students of government colleges and polytechnics, besides abolishing tax on sanitary pads.